Why "Scandalous" mercy? 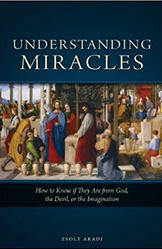 In these pages the reader will discover unexplored aspects of the Heart of God that you might think are crazy! Crazy with love! You will meet Mother Teresa, Maryam of Bethlehem, a Nazi criminal, a priest condemed to hell, a high-ranking abortionist, a drug dealer from Brazil, a furious mother-in-law, a sick child....and in the middle of all this, the most beautiful Heart of Christ, who is calling ALL His children.